Saturday, Dec 1, 9 a.m. – 3 p.m. Include child’s last name, first name, grade, Bryant Elementary, contact last name, first name, phone, email address and reason for free entry. Bryant Running Club is open to all students, grades K-5, who are interested in running. Runners will meet with a volunteer coach to stretch, play running games, and run laps at their own pace. We will be meeting on the track and field at the back of the Bryant school playground from 2:25-3:10 p.m. on Fridays from September 21st to October 26th. Another session will be offered in the spring semester. Registration: We will not be collecting a club fee this year, however all runners must register and sign a waiver ahead of time. Fill out your registration form and waiver online. Interested in volunteering with the Bryant Running Club? We are always looking for volunteers to help sign kids in and out, distribute tokens, and help facilitate activities. For more information contact volunteer lead Kim Bernier or coach Zosia Brown. Keep on tracking your trips! We are off and pedaling for Bike Month 2018! 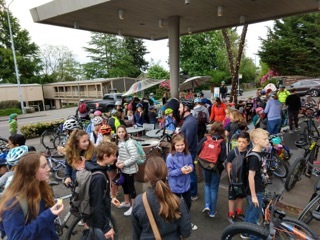 We had a spirited Bike to School Day meet up at Top Pot, which involved 120 donuts, 3 coffee boxes, lots of bike decorations, and plenty of cheer. We counted 124 kid bikes parked in the racks in the morning. Thanks for coming out! Now it is time to track trips for Week 2 (May 7-11) on our online trip tracker here. A new input this year is mileage; it’s optional, but if you choose to enter it, include all bike rides taken during the week. We know many of you bike more than the prescribed school days, and we are curious about the distance accumulated. Questions? Michele Solis or Will Mitchell. Time to track your bike trips in May! 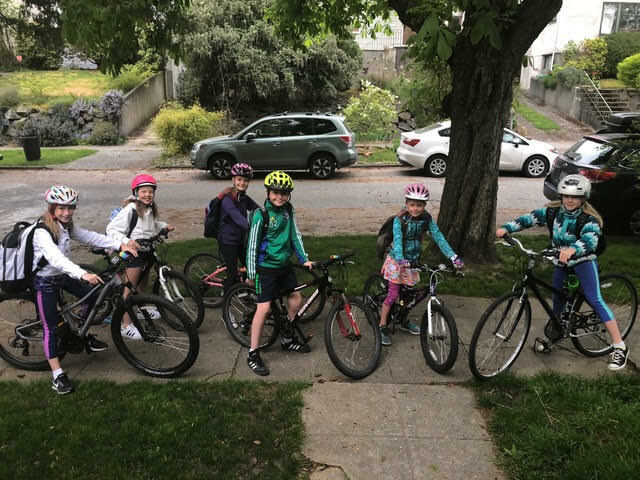 The neighborhood is lively with kid bikers, which means that it’s time to track trips for Week 1 of Bike Month! Please go to our online trip tracker and tell us how many times you biked this week. There will be prizes this year for students who bike the most trips in May, for the classroom that has the most trips, and other categories. Remember, if your child is not able to bike to school, you may count other biking trips such as to the library, grocery store, sports practice, etc, and of course, simple pleasure cruises count as well! 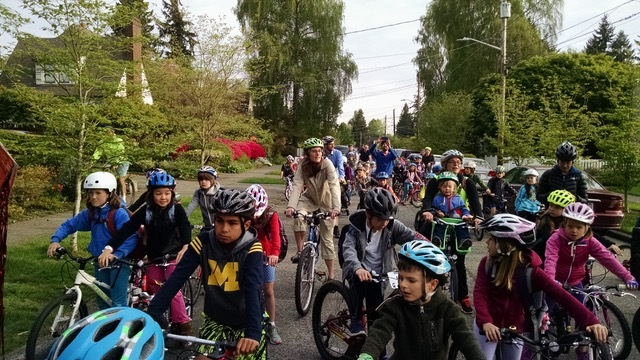 Also, remember to make plans to get up early next Wednesday, May 9, for our annual Bike to School Day celebration. Meet at Top Pot in Wedgwood (6855 35th Ave. NE) after 7am for free donuts and coffee, then head to school with your friends and parents. 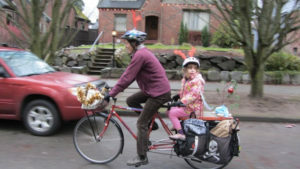 ** This year the Bike Fairy will not lead a parade; instead she will see you off at Top Pot before she heads to another school to spread more Bike to School magic. Today the Bryant Bike Fairy counted 83 bikes in all (including 2 unicycles! ), and caught 7 students riding to school. Way to go! Time to gear up for Bike Month! Calling all Bryant bikers — May is Bike Month, and it is Bryant’s tradition to celebrate all month long. First up is Bryant’s Kickoff event on Friday, April 27, on the playground after school. Bring your bike for free bike tuning! Decorate your bike and your helmet! Play the ever popular paper toss game! Sign up to track how many bike trips you make in May. Calling Bryant walkers and bikers: our last walk/bike event of 2017 will take place Friday morning, Dec 15. Where: Top Pot Doughnuts in Wedgwood (6855 35th Ave NE). How: NEW FORMAT — come for donuts and coffee, visit with friends, get merry, then head to school with your parents as you please. 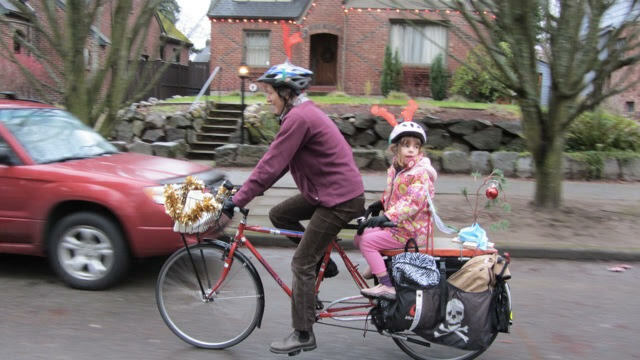 In the past the Bryant Bike Fairy has led the bikers en masse to school, but she is not going to do that this time. It’ll be dark so make sure you have lights or reflective gear so we can ride and walk safely. For many of us, the winter holidays are a time to indulge in good food and sweet treats. However, for many students on free and reduced meal plans, the winter holiday represents a time of food insecurity where they don’t know where their next meal will come from while away from school. With the support of 4th grade families, the Student Hunger Service Project will provide food insecure students in Northeast Seattle with food over the winter break. The 4th grade food drive runs Monday, November 27 – Monday, December 11th. Collection bins are located in each 4th grade classroom and includes Kearney’s, James’, Salisbury’s, and Benaltabe’s split 4th/5th grade class. All food donations are due by December 13. (If you don’t have time to shop, you can donate money towards the HIP food drive and we’ll do the shopping for you on Thursday, December 14). The packing party where food items are assembled into 100 HIP packs will be Friday, December 15 at 7pm in the lunchroom. Please look for the Kid mail flyer and email from room parents with more details and a SignUp Genius link to donate specific individually wrapped items. Direct any questions to Amy Hughes or Leeann Huntington. Thank you in advance for your support.